I've been spending time with some artists lately and heard one of them describe his art as a pursuit and a longing. He said that he used to think he could write a song that would sum it all up, ending the pursuit and satisfying some sort of lack in his life; but later he realized that this would never be the case, and that life would be a never ending pursuit of satiating this nondescript longing. As an artist myself, I can relate. I have an overwhelming desire to write, tell stories, make music and shoot movies; so much so that any free moment needs to be filled with one of those pursuits. What's worse, is that the ideas keep coming, but the time to flesh them out is rarely there, and so I'm left with a constant feeling that I'm behind and may never catch up. So what would happen if I never told all of those stories, or wrote all of those songs? Would the world be any worse without my art? Would I be any better or worse of a person because of it? Or is all of this just a distraction? As I listen to men speak about longings, and follow pursuits on paths such as these (or even more "noble" endeavors, like child rearing or finding a spouse), I can't help but think that we're all just looking for Jesus. Keep your life free from love of money, and be content with what you have, for he has said, “I will never leave you nor forsake you." Only God satisfies. So why do we endeavor so hard after anything but God? I think the answer is that, when we create, we are acting like God. He is the ultimate Creator, and I would argue my truest moments of creativity come about from God. I've tried writing songs and stories on what was clearly my own volition, and they usually are empty. And then there are times when the words fall from the sky and spill onto the page, as if God lassoed me with some sort of inspirational conduit and shot sparks of creativity into my being. Ask any artist, Christian or not, and he or she will tell you about this experience. The same applies to fatherhood or serving others...in these cases that seem to provide some sort of satisfaction for our souls, it is because we are acting like God. God is a Father. God sacrificed Himself for us. When we perform these acts, we are imitating our Father, and it feels good. A beautiful album by All Sons & Daughters. But will it ever totally satisfy? Is there such a thing as complete satisfaction? The bible speaks of the "fullness of Christ Jesus" -- how does this come about? I pray that out of his glorious riches he may strengthen you with power through his Spirit in your inner being, so that Christ may dwell in your hearts through faith. And I pray that you, being rooted and established in love, may have power, together with all the Lord's holy people, to grasp how wide and long and high and deep is the love of Christ, and to know this love that surpasses knowledge -- that you may be filled to the measure of all the fullness of God. According to that second verse, we are strengthened with power through the Spirit, so Christ can dwell in our hearts. Then, with a foundation of love, we will have the power to understand how deep Christ's love is, which ends up filling us with the fulness of God. There are a couple key ingredients: love and power through the Holy Spirit. If I write a song that will move hearts...if I paint a picture that will inspire the masses...if I write a piece that alters the course of history...if I create anything, and have not love, it is only a noisy distraction from the true longing of all our hearts, which is Christ. 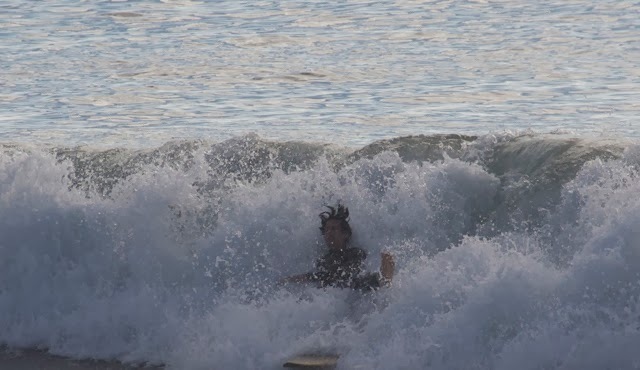 Have you ever been sitting in the lineup and waiting for a set when, out of nowhere, a giant bulge of water comes at you like a miniature tsunami? You're in line for a normal set, but this is something different, breaking farther out and bigger; and so you have to make a split-second decision to either paddle and beat the wave, or sit and duck dive six feet of white water. THE BAD PART is that you may end up waiting forever for these standouts, and miss a lot of regular set waves in the process. The last time I was in this situation was during the Hurricane Marie swell at Leo Carillo. The standouts were rolling in at 8-10 feet and with a lot of rocks hidden by the lineup, I did not want to miss a duck-dive and go over the falls on one of these. And so what I did was camp out between the regular lineup and standout set. I'd see a standout and paddle out, beating it, and then paddle back to just past the lineup to catch some of those. The problem with this strategy is that you miss a lot of waves because you're just past the regular break, and you're also living in constant fear that a standout is imminent. It's kind of like a person who builds an underground shelter in fear of a zombie apocalypse, spending a considerable amount of time there, but also tries to live a normal life above ground -- this person will live a halfway-life on both sides. And so I learned an important lesson that day: DON'T FEAR THE STANDOUT. It was a silly thing to live in fear between the lineups. It's best to take what waves you're given and hold on when the big one comes. Either that, or wait for the standout and get a few massively epic rides rather than several mildly epic rides...you're choice. There's a life lesson in there somewhere too, which is often the case with surfing. I'll let you decide what it is...but whatever you learn, hopefully this post will help guide your decisions when that monster approaches! They say pride comes before a fall...but they didn't mention anything about the washing machine tumult after the fall, followed by gasping for air and a long swim in. Last winter was a big one for me in Southern California, with waves in the 20+ foot range at some breaks. As we head into this winter, I thought I'd share a couple stories of some of the bigger days from last year, and the lessons learned past the aftermath. February 2014: Massive swell coming through. My friends and I shared bloated surf reports through texts and social media leading up to the weekend, excited for the potential glory ahead. But deep down, a tiny nagging worry was there in the pit of my stomach asking if I could handle it. Of course I could handle it...right? The big day comes and, after checking out a couple unsurfable spots (huge closeouts on shallow sand), we back-tracked to a break where some other guys looked like they were having a good time. We suited up and paddled out, only to immediately be swept into a current and carried down into a cove and back to shore. The humility began. This happened three more times as I'd head for the break, only to get carried away and pounded by the ten foot waves. All the while I was watching guys shred these beautiful right-handers, snapping the tops of overhead sets and then paddling back for more. Well, fast forward a few days and my friend Russell tells me he went out again, not able to make it to the break. "Really Russell? You couldn't even make it out?" I haughtily thought to myself. "What a wuss...." And then it happened --a few days later I pulled up to what is normally a fairly docile beach and the waves were breaking 30 yards past their normal spot in huge sets. Fear set in. I watched the waves as I approached the beach, thinking to myself, "Your daughter is due next week, Rick. Don't die." The middle waves were heavy closeouts, unless I could make it to the huge sets in the back, so that was my goal. I looked for my spot, eventually finding a little lull, and went for it. I then got slapped by some incredibly handsome whitewash as I watched the only other surfer out catch a beautiful right-hander and ride it with style. Eventually, I made it pretty far before I realized I didn't put nearly enough wax on my board because I'm sliding all over the place. So I went back in without catching a single wave and waxed up. Try #2: more of the same -- pounding and never ending sets. As soon as I thought I'd made it out to the break, I peeked over the crest of the wave I was paddling over and a wave twice its size was crashing in front of me. I got a lot of duck-diving practice that day...a lot. Defeated and dejected, scared and bleeding, I performed the walk of shame back to my backpack on the beach -- all the while watching awesome waves roll in, one after the other. Soon the other surfer came in and told me about how wonderful the waves were at the break. I sheepishly told him I never made it. "Oh," he said, with a little consolation in his voice, and nothing more. After he left, I stood there for a long time, watching the water and wondering if I should have paddled back out. I wanted to. I'm not one to quit easily. But the reasons to stop (bleeding lip, responsibilities back home, the "shark") kept popping up, so I left. As I walked to my car, I decided that this would not be a defining moment in my life. I won't be the guy who gives up after half-an-hour of paddling because he's tired. It was just an off-day. A day counted as experience and a good workout. A day to be forgotten, save the lessons learned. A day for humility.